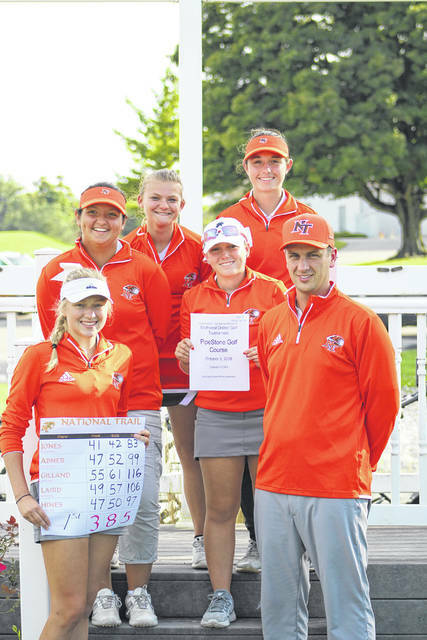 National Trail’s girls golf team advanced to the district tournament after winning the Division II sectional last week. 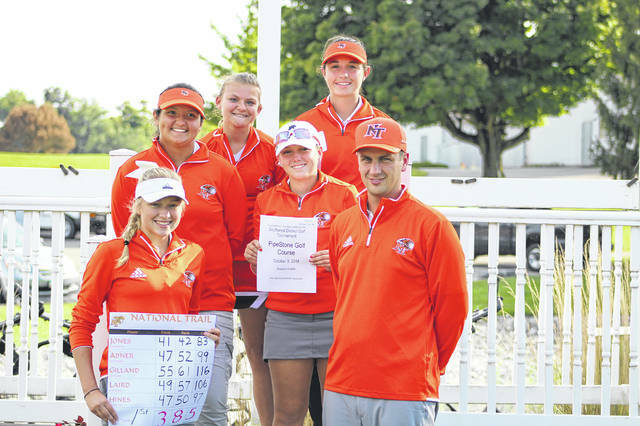 PREBLE COUNTY — The National Trail girls golf team captured a sectional title on Wednesday at Stillwater Valley GC with a team score 385. The Blazers finished 10 shots better than second place Ben Logan. Leading the Blazers was overall medalist Makenna Jones with an 83. Katelyn Hines carded a 97 and Savanna Abner a 99. Makena Laird rounded out the scores with a 106. Caitlin Gilland also competed and shot a 116 for the Blazers. The girls will travel to Districts next Wednesday at PipeStone. Eaton’s Ainesleigh Elstro shot a 91 to advance as an individual to the district. As a team, Eaton placed 8th. Kyla Mize shot a 105. Also competing for Eaton was Alina Fore (127), Carly Bricker (132) and Hikaru Sato (133). Tri-County North’s boys placed second to qualify for the district tournament. North had three players in the 80s with Spencer Brehm leading the way with an 87. Alex Wayman and Ehtan Kelley each shot 87. Dylan Curtin and Matt O’Dell each shot 104. Twin Valley South’s boys placed sixth shooting a 391. The top four teams advanced to the district. Willie Bowman advanced to the district as an individual with a sixth place finish, shooting a 87. Chance Parks shot a 95, Steve Bitner a 99, Conner Bradley shot 110 and Jacob Clark a 144. Basically, it was a very wet day. We got rained on for a good part of the morning, and that was after the 3 inches of rain we had gotten the night before. So the course was extremely wet, with lots of standing water,” South coach Darcy Robinson said. “That said, I thought our guys played pretty well, overall. We ended up coming in 6th place as a team; one stroke from coming in fifth, and six strokes from advancing to the District tournament. Connor Bradley and Jacob Clark had tough days, but the other three (Willie, Chance and Steve) played well. Willie came in 6th place overall, but since 5 of the top 7 players were on teams that advanced, Willie ended up coming in 2nd place as an individual, so he’s playing on Thursday at Beavercreek Golf Course in the District tournament. He will tee off on hole No. 10 at 10:50 a.m.
Robinson said it was a bittersweet day. Robinson said she appreciated what the senior accomplished during their careers. So as far as Thursday goes, we’re hoping that Willie can go out and play his best round. It’s a tough course, but I know he’ll be up for the task. I’m excited to see him advance and have the opportunity to play against the best golfers in SW Ohio. National Trail boys golf team wrapped up its 2018 season finishing 14th in the 16 team field at the Turtle Creek Sectional in Greenville on Tuesday. Austin Knapp led the Blazers with a 112, while Khyler Grant came in right behind Austin with a 113. Tyler Porter carded a 119 and Jesse Norton rounded out the scoring with a 120. Kevin Christensen also competed and recorded a 141. The Blazers finish the season after improving on last year’s season record and will work this off season to continue to see those improvements. Eaton’s boys finished 12th at the PipeStone sectional. Andrew Collins lead the Eagles with a 93. Travis Pittman shot a 95, while Felix Durham shot 103, Matthew Wright a 118 and Kevin Lam a 112. Preble Shawnee was 13th at PipeStone. Luke Woodard fired a 91 and Caleb Barrett shot a 102. Cameron Gadd shot a 103, while Coltan Groh shot 118 and Levi Brock carded a 121. The girls district tournament will be played Wednesday, Oct. 3 at PipeStone in Miamisburg. The boys district tournament will be played at Beavercreek Golf Club on Thursday, Oct. 4.
https://www.registerherald.com/wp-content/uploads/sites/41/2018/10/web1_ntgg2.jpgNational Trail’s girls golf team advanced to the district tournament after winning the Division II sectional last week.